Man, it is really frustrating to see our SOLIDWORKS customers struggle to use their software to the fullest. I just spoke to one that had a set of defective plates come back from the factory because the holes were called out incorrectly. Fortunately there is a solution for just this problem. With the Hole Wizard Customization Tool in SOLIDWORKS, you’ll be able to easily communicate your SOLIDWORKS designs to manufacturing and add Custom Hole Sizes with ease. Come on I’ll show you. This customer has a standard to use Formed Threads when possible. Here we can see the Hole Callout for Cut Threads. In the past, the ‘formed’ information has been added manually to the Hole Callout, which is the root cause of the defective parts. I let our customer know that we can add the Formed Thread information to the Hole Wizard Database for use like any other Hole Wizard Hole. And just like any other Hole Wizard Hole, SOLIDWORKS will automatically populate the Hole Callout with the correct information. We can access the Hole Wizard Configuration tool two different ways. 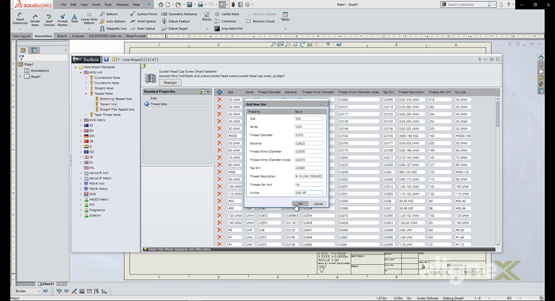 The first is inside of SOLIDWORKS under the System Options, Hole Wizard/ Toolbox, using the Configure button. The other method is in the Start Menu Program list found under the SOLIDWORKS Tools. I have the Configure Tool pinned to the Start Menu for easy access. Once the Configure Tool is open, we can begin creating our Custom Holes. We are going to add a Formed 3/8-16 Threaded Hole to the database. We start by browsing to the appropriate Standard and Hole Type, the ANSI Inch Standard for Tapped Holes. Once we are in the proper location we use the “+” sign to add a new Hole. This step adds the general information like Size, Pitch, and Diameter. Make sure to note the Size Property Name as it will be used in the next step. Next we add the Thread Data for the Hole. This information can come from company standards, the Machinery’s Handbook, or any other source. The important part is to make sure the information is accurate for manufacturing as this information will populate the Hole Callout. Here is where the Full Size Property must match Size Property from previous step. Once we finish adding the Thread Data, we have to make sure to save the changes to the Database. Otherwise, we just wasted time. Once we are back inside SOLIDWORKS, we can create a new Hole Wizard hole with the 3/8-16 Formed Data. As mentioned previously, it works just like any other Hole Wizard Size. Open the property manager and we can see the new Threaded Hole for use in our Models. When we move to the Drawing, the Hole Callout populates with our custom information automatically. No manual updates needed from here forward. 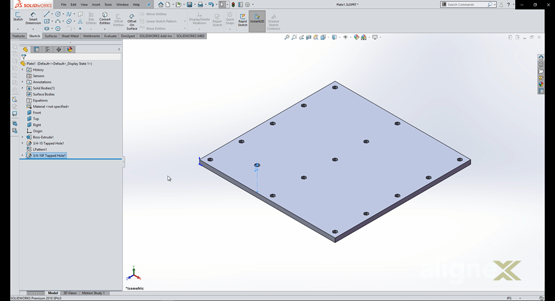 We can of course create custom Sizes for the other Hole Types found in SOLIDWORKS. Maybe your company has a Custom Standard for Counter-bored Holes and the sizes are different than those included in the standard database. Many customers find the Standard Database does not have a size they are using. 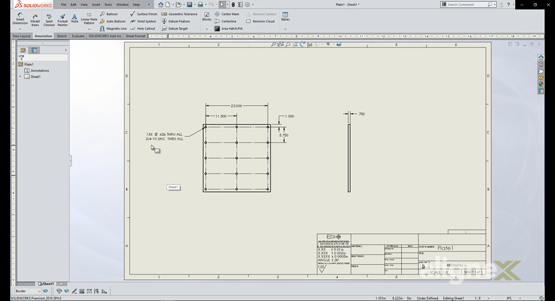 No matter what the reason, we can easily add these sizes to our Hole Wizard database for use in our future designs and drawings in SOLIDWORKS. So there you have it. As you can see, using the Hole Wizard Customization Tool will save countless hours of frustration. Best of all, it’s included free with every purchase of SOLIDWORKS. So there is nothing stopping you from getting started today. For more information check out our Hole Wizard and Toolbox Guide Packet. Thanks for checking out the Alignex Blog. Make sure to subscribe down below to have great information like this delivered straight to your inbox! Mike Dady is an Application Engineer at Alignex, Inc. Mike spends his days working with customers to resolve their manufacturing issues and helps them to improve on existing product designs. If he’s not solving customer challenges, he’s probably at home customizing his snowmobile or working on a home improvement project.